Jig Man had the most liked content! I use a hot knife. As you heat it up it will become clear and get pretty thick then it will thin out again. I like to cook it a minute at a time and take it out and stir it. When it gets pretty thin I add color and glitter and stir it up well before I shoot or pour. You really should read the sticky "Don'ts for newbies". No. You need to grip it tightly to the hook so it can not slide then put a few tight wraps to hold it. I'll bet smalljaw has a video that will show you how he does it. You might look him up on You tube. Don't try to put it all on at once. Make several wraps before putting the hair in. Only put about 1/3 of the hair on and do a couple of wraps to hold it in place, move around the hook a bit and put another third on and do a couple of wraps, move to the last open space and put the last third on and finish wrapping. I work in an unheated garage. I have a cheap electric hot plate. I have a metal sheet on top of it. When I start getting ready to pour I place my injectors and molds on the metal sheet and turn on the hot plate. By the time I get the plastic ready to inject everything is good and warm (sometimes too warm). BTW: I try to pour and shoot around 315 to 330, less chance of scorching. 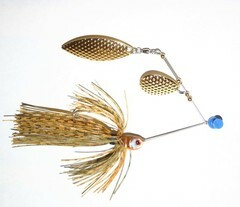 I have tied thousands of bucktail jigs and never had any issues. I don't have any special bobbins. The only thread that I use if flat waxed Danville because I tie so tight that I break anything else that I have tried. Just a few drops of heat stabilizer is all that is needed. Be careful mixing colors or the end result will be brown. I do mostly the same as Ted. I like to finish mine off after it cools with a coat of WD-40. Let it set for a while then wipe it off before I reheat the pot. I also take a small drill bit and gently work it with a pair of pliers into the drain hole and clean it out. Anyone got a contact on the wire used by VMC?